Featuring some of the world’s most exquisite wines, the sunny and dry Mendoza region boasts the ideal climate for cultivating grapes, and produces wines that are regularly celebrated by the international wine community. Whether you are a wine amateur or a connoisseur, Mendoza, known as Argentina’s wine capital, is a must-see for all wine enthusiasts. In addition to its beautiful vineyards, Mendoza also enjoys scenic Andean surroundings, as it sits right underneath the highest peak in the western hemisphere, Aconcagua, which stands at a staggering 22,835 feet (6,960 meters). It is here amidst the stunning countryside of rolling green hills, blue skies, colorful flowers, and gorgeous vineyards that you’ll have the chance to discover the best of Argentina’s wines. Upon arrival to the Mendoza airport, you will be greeted by one of our Argentina For Less representative and taken to your confirmed Mendoza hotel. You will have the rest of the day to rest and spend at your leisure. 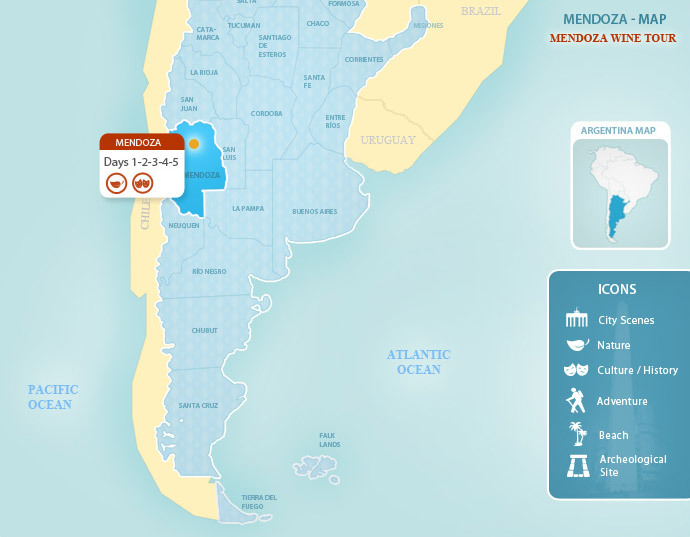 Check out our Mendoza Travel Guide for dining and activity suggestions in town. Today you’ll embark on your first exciting tour of Mendoza’s most famous wineries. After breakfast, your guide will meet you at your hotel for the drive to Mendoza’s beautiful countryside, filled with lush orchards and vineyards. Your Mendoza wine tour will provide you with an expert oenologist guide who will accompany you to 2 of the most prestigious bodegas (wineries), where you’ll have the chance to observe and learn about the wine making process, as well as indulge in tastings of exquisite local wines. The tour will also include a demonstration of how to handle your wine glass to taste the full flavor of the wine. After your tour, you’ll drive back to your hotel in Mendoza, where you can spend the evening at your leisure, exploring the bustling metropolis. Spend the day at your own pace in the scenic wine regions of Lujan de Cuyo and Maipu. You will drive into the heart of Mendoza’s wine region and choose how you wish to spend the day. Whether it be exploring the beautiful countryside on your own, or taking another one of the many Mendoza wine tours, there is plenty to see in Argentina’s wine region. See our additional Mendoza tours for ideas on how to spend the day. At the end of the day, you’ll be taken to a comfortable winery where you can enjoy a delicious dinner and spend the night among the vineyards, sure to be a unique experience for your Argentina vacation. Prepare yourself for another exciting day in Mendoza’s wineries with a half-day guided visit of two excellent bodegas. After your visit, you’ll be treated to a true gastronomic experience with a delicious lunch accompanied by some of the world’s best wines. After the tour, you’ll be taken back to your comfortable winery to spend the evening at your leisure. Enjoy a filling breakfast at your hotel and meet your transfer to the airport for your journey home or on to your next destination. Browse our full range of Argentina travel destinations for additional vacation ideas.